A Blog Of Ice Cream: Making Ice Cream Can Be Fun! Making Ice Cream Can Be Fun! 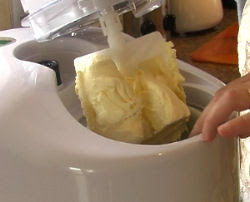 Most people love ice cream yet only a small percentage have ever made their own ice cream at home. That's amazing to me - and to anyone who DOES make their own ice cream - because it is not difficult and can be enormous FUN! Whether you have an electric ice cream maker (photo on the right shows me using mine at home) or not makes only a little difference - it will just take you longer to make your ice cream without a machine that's all. A good analogy would be that of breadmaking with or without an electric bread maker. I have written a page called Making Ice Cream in which you will find 3 different methods of ice cream making plus links to pages on key ingredients, what a custard base (cream base) is and other types of ice cream you can make such as gelato and sorbets (water ices). There is also a link to my measuring guide for both dry and liquid ingredients.